28 Monday December 30th 1895 I was busy about the work all forenoon. The boys went to hunt a little while and got a couple of rabbits. After early dinner Will and I went down to Elmer Andersons for a short visit. It was quite cold coming back. I got supper over and wrote some in the evening. 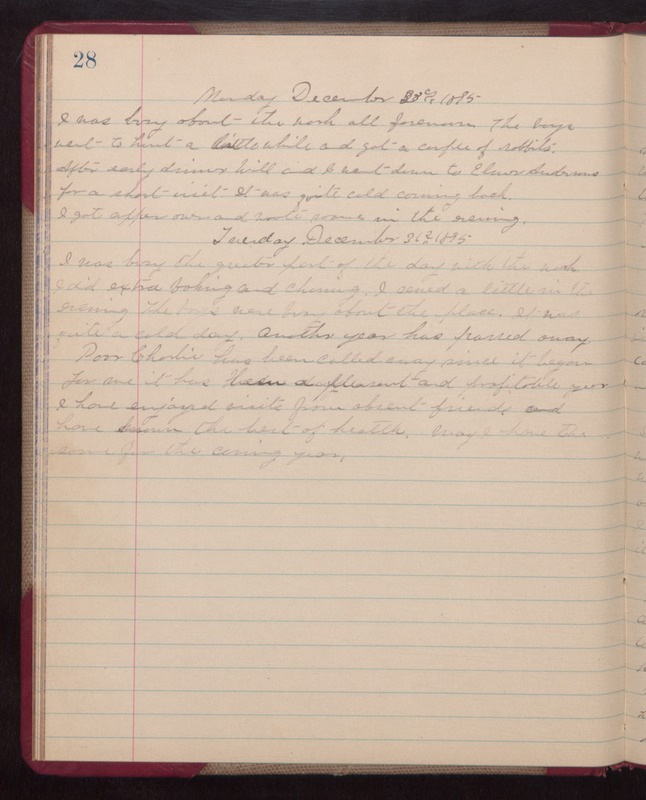 Tuesday December 31st 1895 I was busy the greater part of the day with the work. I did extra baking and churning. I sewed a little in the evening. The boys were busy about the place. It was quite a cold day. Another year has passed away. Poor Charlie has been called away since it began. For me it has been a pleasant and profitable year. I have enjoyed visits from absent friends and have known the best of health. May I have the same for the coming year.